My children love to make sun catchers. They are so quick and easy to set up and they are my go to craft if one of them asks to make something and I don’t want to think about it too much. 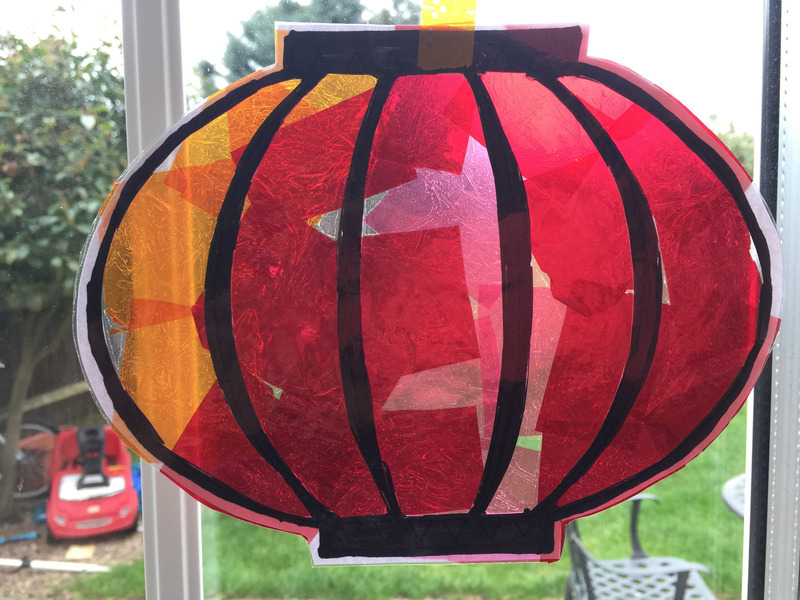 With Chinese New Year around the corner I set up a sweet Chinese lantern sun catcher activity for my 3 year old daughter yesterday. 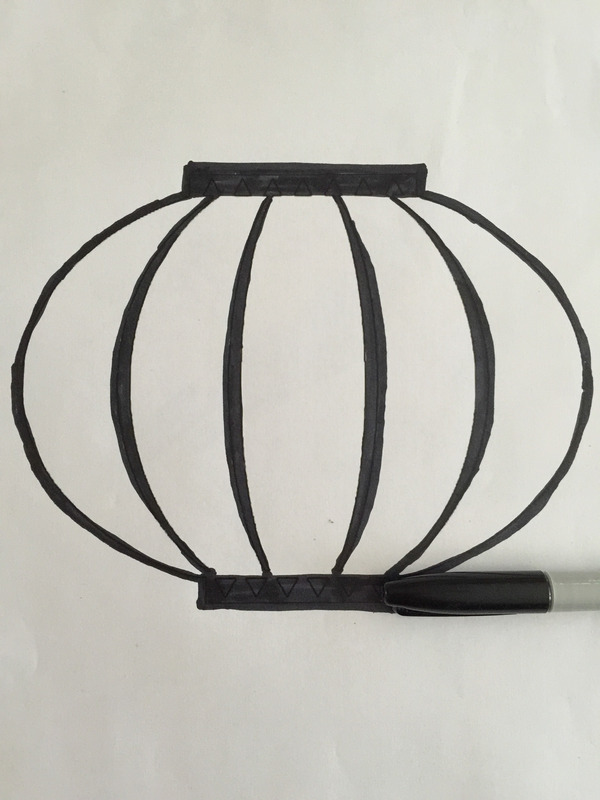 First draw your Chinese lantern. I drew mine with a black Sharpie on a piece of white paper but it might be easier to draw on black paper and cut it out. Make sure you leave lots of spaces to fill with colour. I cut pieces of red cellophane into small pieces and placed the Chinese lantern on a piece of contact paper. My daughter loves contact paper and when she wasn’t sticking her hands all over it she carefully placed pieces of cellophane into the gaps. When she had filled all the spaces we placed another piece of contact paper over it to seal it. Then I cut round the lantern to remove any extra pieces. We love our Chinese lantern and have hung it up in the window. I think it’s calling out for some tassles so I’m going to have to look for some ribbons to add to the bottom. Chinese New Year Fortune God Mask from Witty Hoots, TP Roll Chinese Lanterns from In the Playroom, Thumbprint Chinese Zodiac Craft for Kids from Fun Handprint Art, Cheese Chinese Lanterns from Danya Banya, Wool Painted Fans from Crafts on Sea, Sheep Stick Puppets from Best Toys 4 Toddlers, Felt Shape Sheep from Mama Smiles, Sheep Letter Recognition from Something 2 Offer, Chinese (non firework) Firecrackers from Peakle Pie, Chinese New Year Card from Creative World of Varya, Chinese Dragon from Messy Little Monster, Paper Plate Chinese Dragon from Kiddy Charts, Dragon Painting for Preschoolers from Learning and Exploring Through Play, Bubble Wrap Sheep Craft from Multicraftingmummy, Chinese Dragon Dance from Study at Home Mamma and Chinese Zodiac Animals in Lego from Planet Smarty Pants. Aw this is so cute! And so easy to make 🙂 definitely going to be making one of these when my neices are next over! That looks great, very pretty to hang on the window and lots of fun. A lovely way to brighten up your window. 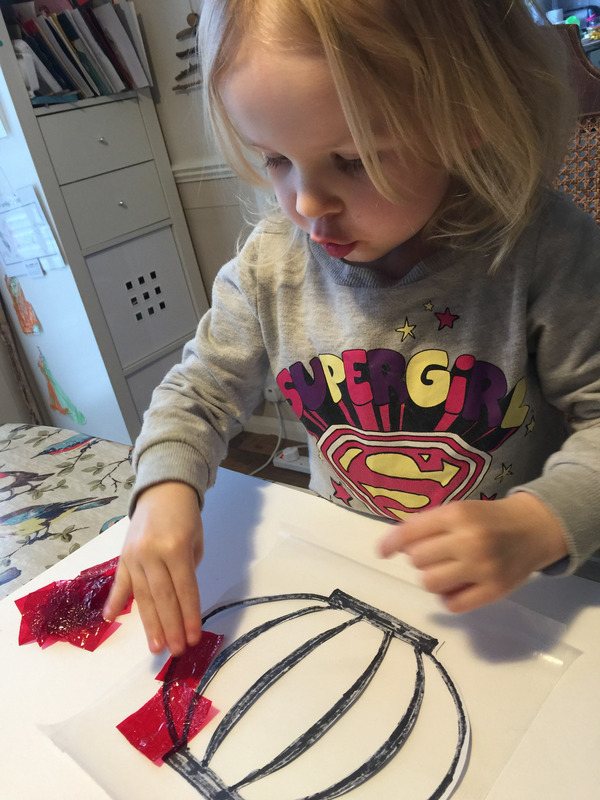 We ve been wanting to have a go at suncatchers for a while now but i ve been struggling to get some contact paper.